Aside from Father's Day i haven't had any other event to bake for :( On the weekend i decided that i had to bake something, anything! 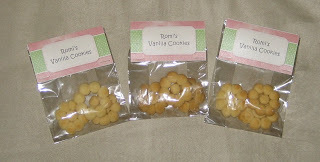 So i decided on cookies which i would put in little cellophane bags and top with a bag topper. My husband and i popped into office works and found some gorgeous paper, which was on sale, yay! I downloaded a template for place cards and used this as the bag toppers, they are the perfect size! 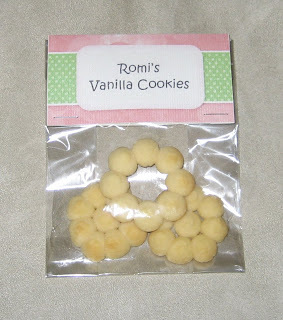 I used my Avanti Cookie Press which my husband gave me for my birthday last year and made very cute looking round cookies. We had a production line going on Sunday night...my husband cut the tags, i put the cookies in the bags and then we stapled them. It was a fun little project!